My daughter has just turned 1 and she sleeps 15-16 hours at night and anything up to a 4 hour nap during the day too! So she could sleep up to 20hours per day! (Average is 18) She has gained alot of weight, was 5lbs born and now 12kgs. Here in the UK we have a percentile chart and she was on the 0.4th born and is now on the 99.8th. A HUGE jump. She has maintained the 25th centile for her height. She has 2-3bottles of milk of 6ozs in each. And has 3 meals a day plus 1 snack. So doesn't over eat. 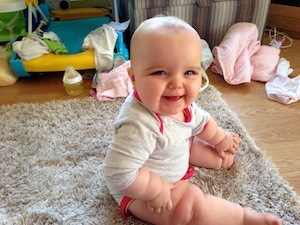 I can't think why she has gained so much weight..
She also doesn't roll over, crawl, pull herself up, stand by herself, walk....actually she has no interest in moving what so ever. 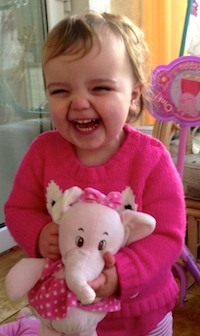 She babbles and understands 'hiya' 'bye' 'peekaboo' 'blow kisses' and does hand gestures to mimick you. I have hyperthyroidism and my great gran was hypo but it wasn't childhood set thyroid disease. I was diagnosed at 23 and my gran much later. If be so grateful if you have any ideas on what's going on with my daughter as my doctors here aren't saying too much but my instinct is saying something is wrong. 1.) 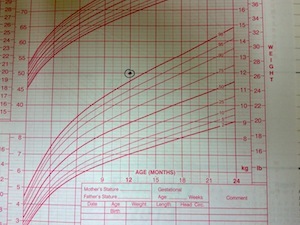 Weight - I plotted her on a growth chart and she is above the 98 percentile for weight for a 12 month old girl. While, I agree she is big, two percent of girls are “above 98th percent”. I also agree that her milk intake seems reasonable for her age. See milk for 1 year olds. If she is only awake for 4 hours a day then she probably has significantly lower caloric use compared to other 1 year olds. 2.) Sleep - 19 to 20 hours a day of sleep is excessive. The average 12 month old only sleeps 13 to 14 hrs per day (nighttime plus two naps). Has she always slept a lot or is this new? Is she taking any medications? 3.) Delayed development - When pediatricians evaluate a child’s development we analyze three distinct areas: gross motor, fine motor and speech. Your daughter seems delayed in gross motor development, as she should pull up to stand and get into a sitting position. Hypothyroidism (low thyroid hormone levels) is a good thought. It could cause excessive weight gain, sleepiness and developmental delays. Thyroid conditions often run in families and are more common in females. In the United States, we have infant screening programs that screen close to all infants for hypothyroidism shortly after birth. I don’t know about screening in the UK. Even if your daughter was already screened at birth, I would consider re-screening. Honestly, there are many possible causes of your daughters symptoms. Her weight alone does not worry me, but combined with her sleep and developmental patterns I am concerned. She deserves a thorough medical work up. Follow your instincts. Call your doctor and make an appointment. Get a second opinion if needed. Keep a calendar of her diet and the hours of sleep. Let me know how she does. Good news, she is doing great! As you had suggested, we called our doctor. He was concerned too and began a work up. All of the blood work, including labs for thyroid issues, were normal. Our doctors were quite shocked to find she had lipomas, fatty clumps, in her lower legs - but they have since disappeared. Today, she is a normal little girl. She has caught up developmentally and is an appropriate size. She actually weighs less than she did when she was 13 months old and is now 25 months. She is currently 24 lbs and very short. I am only 5 feet 4 inches , so she isn’t going to be tall. Looking back, I think it was just purely down to her not moving much and she liked her sleep. She still sleeps 14-15 hours at night, but doesn't nap in the day. Thanks for your help.